The type of restaurant that, once again, makes you ask yourself why you don’t live in Rome. 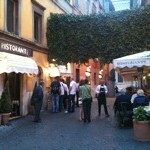 A short but varied menu, mostly consisting of Roman dishes, in Trastevere. The provision of soft rugs over the back of each chair – just in case you needed to wrap up – was the first indication that this isn’t just any Trattoria. Founded in 1907, this delightful restaurant is in a delightful spot, and well worth a visit. Asinocotto really does translate as the Cooked Donkey. It does not, by Roman standards, translate as cheap. Interesting local dishes; the fact that those queuing are mostly Italian says it all.